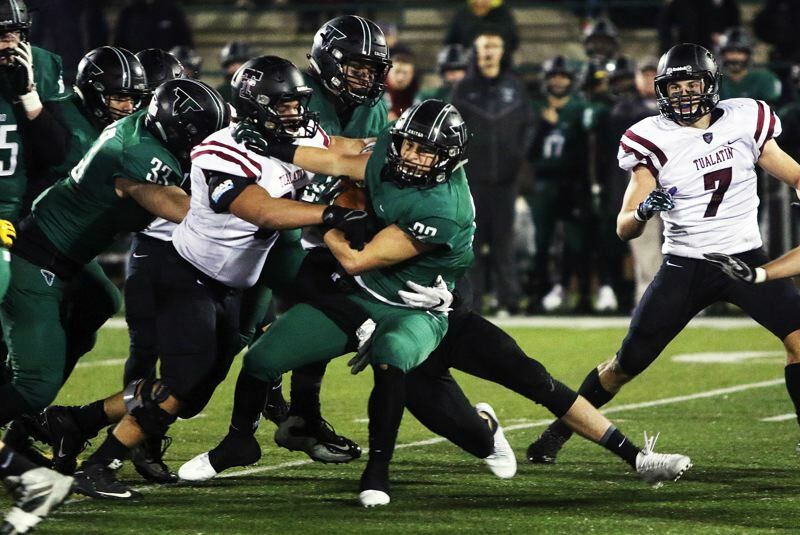 TIGARD — Less than eight minutes into the highly anticipated rematch, the Tualatin High School football team was holding a 9-0 lead over rival Tigard. At that time, there was much excitement and enthusiasm to be found on the Timberwolves' side of the field. Meanwhile, on the Tigard sidelines, there was just calm — no worry, no panic. The Tigers knew they had a game plan — and they were going to stick with it. That game plan turned out to work pretty darn well. 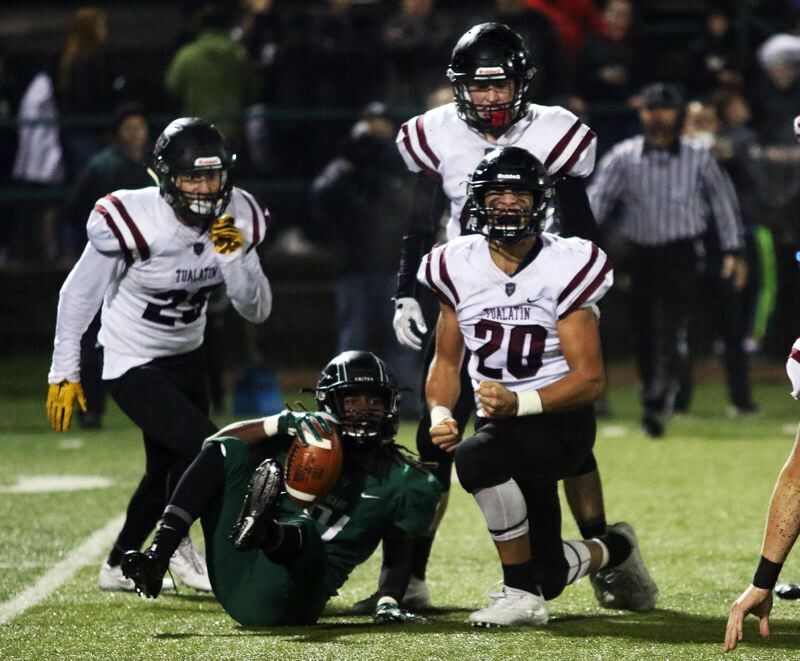 The Tigers answered Tualatin's fast start by scoring 38 unanswered points on their way to getting a 38-17 win over the Timberwolves in a Class 6A state playoff second-round game played Friday at Tigard High School. "This is huge," said Tigard sophomore Max Lenzy, who had one of the big plays in the contest, with an interception return for a touchdown late in the first half. "Tualatin came here, and they were ready, but they're our rivals, and we were determined to show that we were here to play football." "This is really huge," said Tigard senior Spencer Smith, who rushed for 100 yards and a touchdown. "We won our last game (a 42-35 first-round playoff win over Barlow), but we didn't play well. We wanted to show that we can play like we know how to." "This was a really big win for us," said Tigard senior receiver Jakob Harrold, who had 73 receiving yards. "This was the second time to play them. They came with a lot of intensity, and we did, too. We just wanted to keep the pedal to the medal." 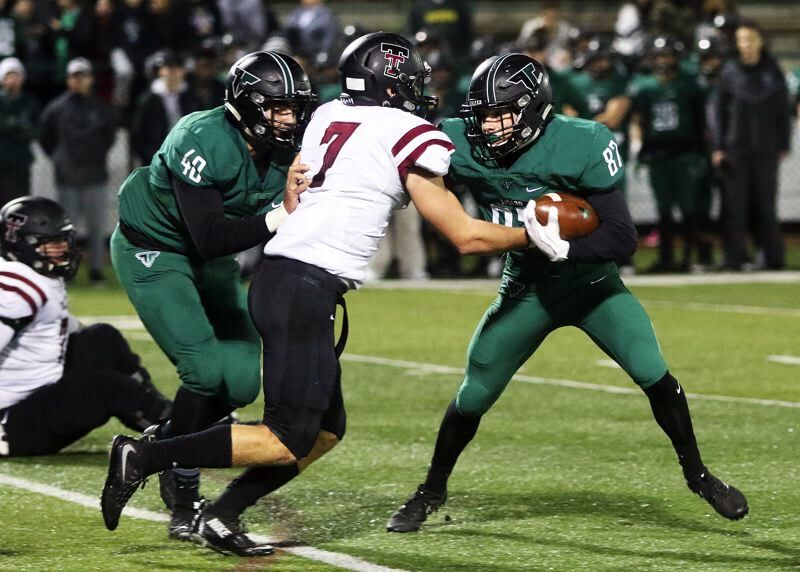 "We found our focus in the playoffs," Tigard senior linebacker Jacob Beck said. "We're disappointed with how we played last week, but that gave us focus. We kept our laser focus and our tempo tonight." With the loss, Tualatin, the No. 4 team out of the Three Rivers League, and the No. 11 team in the final OSAA power rankings, finished its season with a final overall record of 7-4. 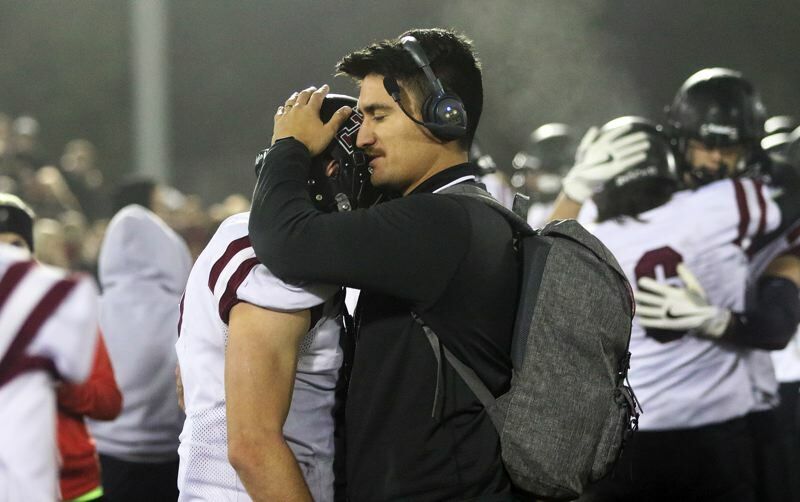 "This meant a lot to us," Tualatin junior quarterback Kyle Dernedde said. "This is what we wanted. This game was a physical battle. This game really meant something, and both teams played a heck of a football game." 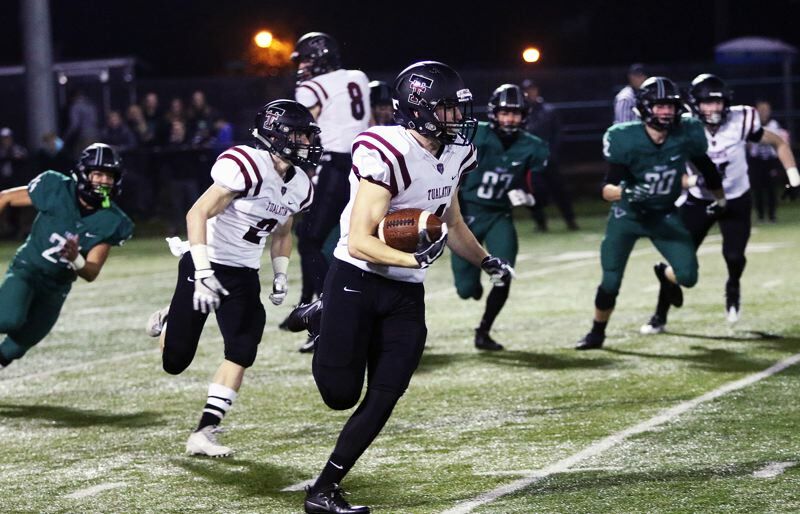 "It was an outstanding season," said Tualatin sophomore John Miller, who had a touchdown on offense, and an interception and fumble recovery on defense in Friday's game. "We bounced back strong. A lot of people projected that we'd win just three games. We won a lot more than that. I'm really proud of our team." Tigard, the No. 1 team out of the Three Rivers League, and the No. 6 team in the power rankings, improved to 9-2 on the season with the win. The Tigers also earned another Three Rivers League rematch, as they advance to play at West Linn in the state playoff quarterfinals. "This game will help us slingshot into the quarterfinals," Harrold said. "We're really looking forward to it." 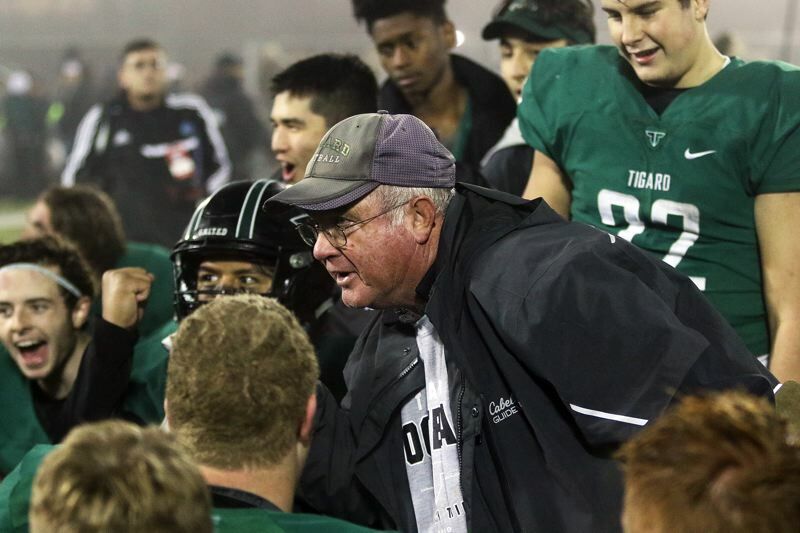 Both teams were looking forward to Friday's rivalry rematch at Tigard. It was two weeks earlier that the teams met in a TRL finale. 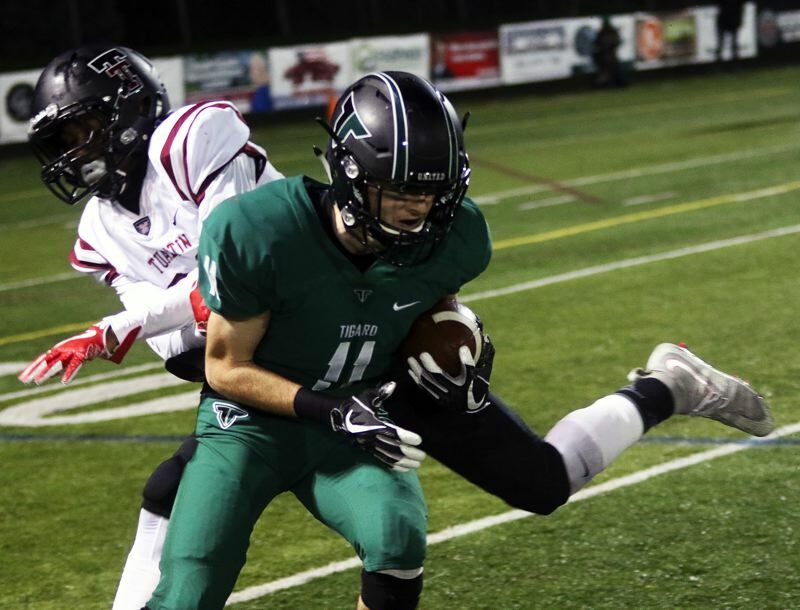 In that game, widely known as the game that started at Tigard, but was moved to Tualatin due to a power outage, the Tigers came out on top 28-6. There were no such dramatics in the rematch. But, instead, it was a flying start by the Wolves that got everyone's attention. Tualatin senior Nathan Marx returned the opening kickoff 59 yards, helping set up a 33-yard field goal by Dernedde, which gave the Wolves a 3-0 lead with 9 minutes and 44 seconds left to play in the first quarter. The next time Tualatin had the ball, Dernedde and Miller teamed up on a 60-yard touchdown pass play, upping the Wolves' lead to 9-0 with 4:14 left in the opening period. 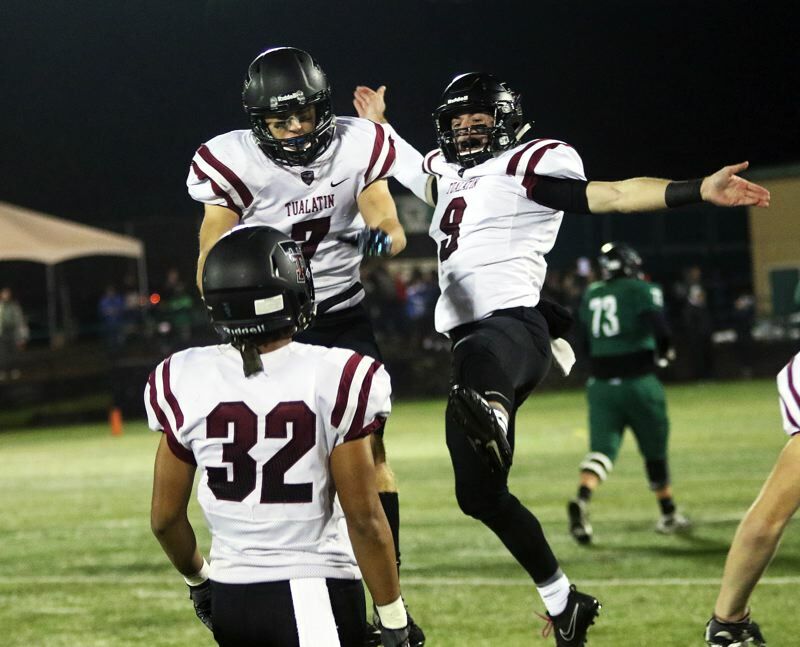 "We came out so ready to play," Dernedde said of Tualatin's fast start. "We really wanted this second chance." Still, there was no panic for the Tigers. "We weren't that worried," Harrold said. "We had a game plan." "We knew we were just going to stick to the game plan," Beck said. "And we stayed united as a team." "We were a little surprised," Smith said. "But we used it for fuel." In the Tigers' ensuing possession, they got a 32-yard field goal by sophomore Jackson Cleaver to trim the Tualatin lead to 10-9. 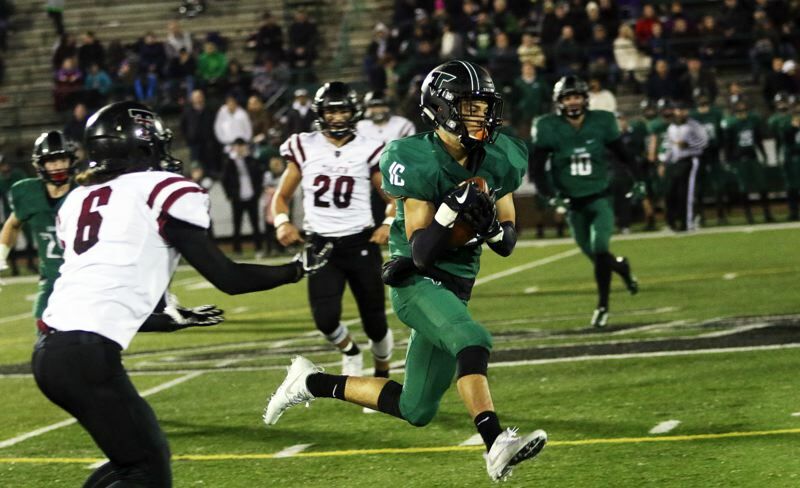 On the next Tigard possession, a 27-yard pass from freshman quarterback Drew Carter to Harrold helped set up a nine-yard touchdown run by senior Jake Leavitt, giving the Tigers a 10-9 lead with 5:25 left to play in the second quarter. The next Tigard possession went much the same. 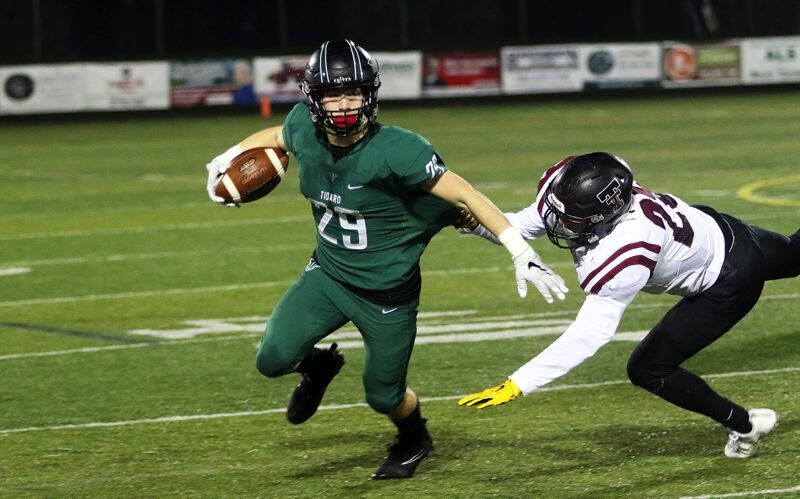 This time, a 19-yard Carter-to-Harrold connection helped set up an eight-yard scoring run by Smith, which gave Tigard a 17-9 lead with 2:07 left in the second quarter. But the Tigers weren't done with their first-half scoring spree quite yet. 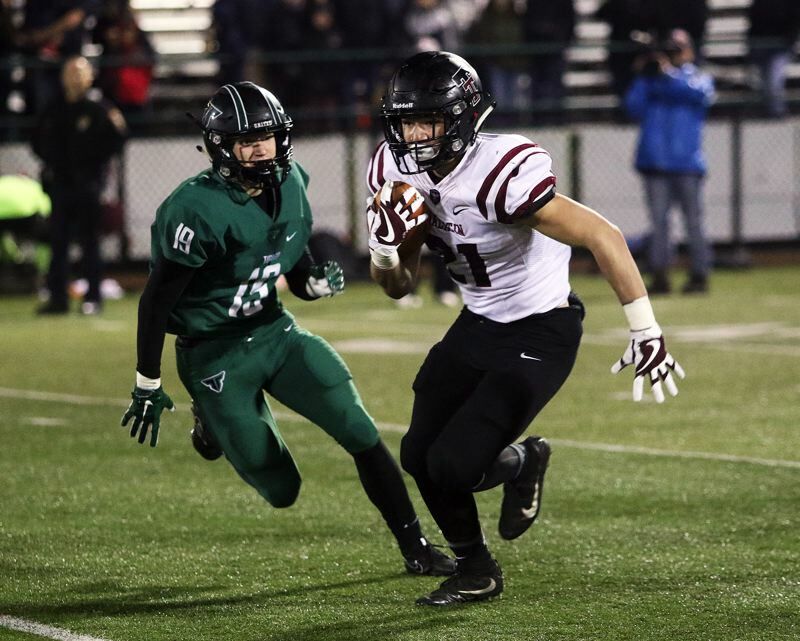 On the ensuing Tualatin offensive possession, Lenzy intercepted a pass toward the outside, and sprinted 51 yards untouched down the right sideline for a touchdown, upping the Tigard lead to 24-9 with 1:05 remaining in the first half. "That was a big momentum play," Lenzy said with a smile. "I was in motion that way, and I saw the pass and I got it." There was no scoring in the third quarter. Tigard did get a key defensive play in the period, with senior Skylar Holloway intercepting a Tualatin pass at the Tiger 6-yard line with just over three minutes to play in the quarter. Tigard then put the game away in the final stanza. Carter scored on a two-yard run on a roll out to the right, pushing the Tiger lead to 31-9 with 4:00 left in the game. Tigard junior Malcolm Stockdale added a touchdown on a nine-yard run to make the score 38-9 with 2:44 remaining. Tualatin, battling to the end, got a 17-yard touchdown run by sophomore Blake Jackson with 0:51 remaining, making the final score 38-17. "That was a lot of fun," Beck said. "We like playing smash-mouth football." "Once we got momentum, we were unstoppable," Harrold said. "That's the nature of Tigard football." "We kept playing physical," Smith said. Tigard certainly seemed to play physical on defense. The Tigers limited Tualatin to 229 yards of total offense in the game, with just 38 of those yards (on 21 carries) coming on the ground. 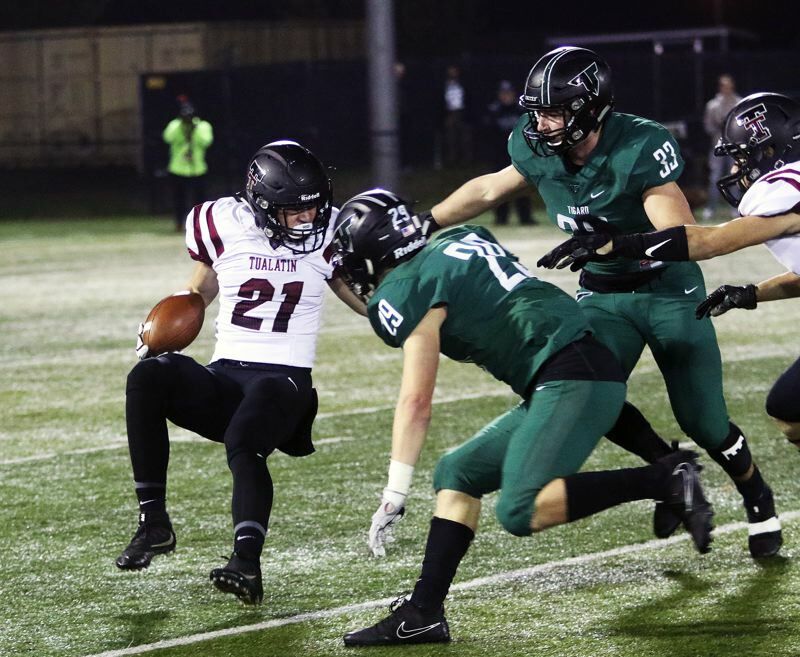 "Tualatin is a very good football team, and they had a great season," Tigard coach Craig Ruecker said. "They hit us with a big kickoff return and then a big pass play at the start. But, other than that, I thought our defense was fantastic." "Our game plan was right on point," Beck said. "I thought we played great as a whole." Beck and junior Carter Dennis each had a quarterback sack for the Tigard defense. Senior linebacker Trevor Moler had a pair of tackles for losses. Junior linebacker Mitchell Cross had a tackle for a loss and Holloway had a tackle for a loss to go with his interception. 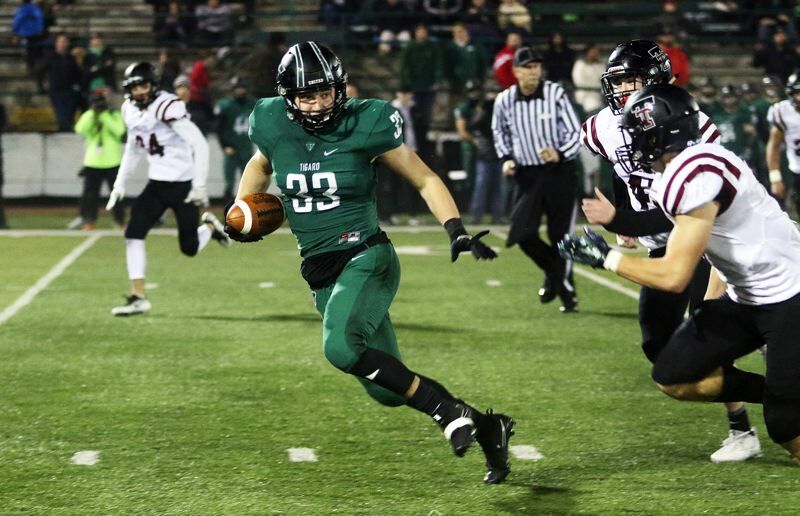 Tigard, on offense, ran for 237 yards on 51 carries. "That was huge," Smith said. "Our line played amazing," Harrold said of the group that included junior Iulius Costa, junior Isaia Tavita Porter, senior Burke Albaugh, senior Laytan Tanuvasa and senior Jaran White, among others. Leavitt rushed for 101 yards on 19 carries and Smith got his 100 yards on 18 carries. Carter completed seven of 14 passes for 94 yards. Harrold had four catches for 73 yards. "It helped getting the passing game going," Harrold said. "Drew threw some gorgeous balls." Miller had a huge game for the Wolves in the loss. In addition to his touchdown catch, he also had an interception, fumble recovery and two tackles for losses on defense. "I came out thinking that I didn't want to let our seniors be done," he said. Dernedde completed eight of 24 pass attempts for 164 yards. "They answered back," Dernedde said of the Tigers. "They're a tough team. Very physical. I respect them a lot." Senior Nick Savage was the Wolves' leading receiver with five catches for 124 yards. Jackson was Tualatin's top rusher with 30 yards on two carries. For the Tualatin defense, senior Lucas Noland and senior Jarius Jackson each had a tackle for a loss. 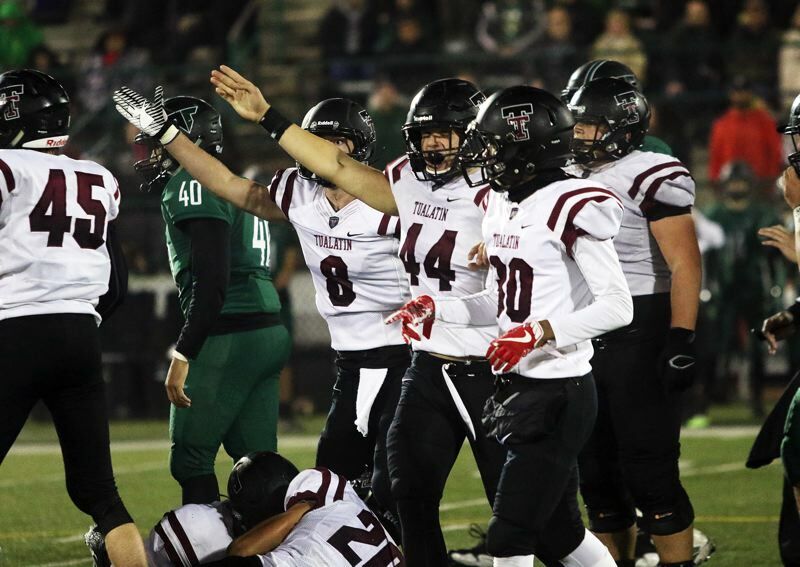 While Tualatin will lose some key seniors from this year's squad, the Wolves look to potentially return a strong core of players for the 2018 season. "Next year, we'll be ready for everyone in league," Miller said. "We're excited for next year," Dernedde said.